Collect some log files and send back to dev team. Usually I use scp to do the copy. Apparently we only scp via key file, instead of password. To scp files from one server to another, I need to store my ssh private key in the server. This certainly brings in some security concerns. Yes, I can protect ssh key by passphrase. Or even better, I can delete it immediately after I have finished the download. hmm… just a bit tricky, and too many manual steps. When I’m asked to copy and share some log files, I usually scp them to my laptop. Then send over via Slack or Skype. Let’s say, the file is ~500 MB. Literally speaking, we need to download 500 MB data, then send 500 MB data. Manually! This would take a lot of time for a doggy network. Isn’t it? Even worse, if the transfer interrupts, our colleagues will definitely ping us to send again. People may solve part of the problems by scp/rsync, Dropbox or ftp. Or using AWS SDK or tools, upload to AWS S3 buckets. However, if we expect no initial setup and super easy for end users, none of them can compete with this one. transfer.sh, an open source project in Github. 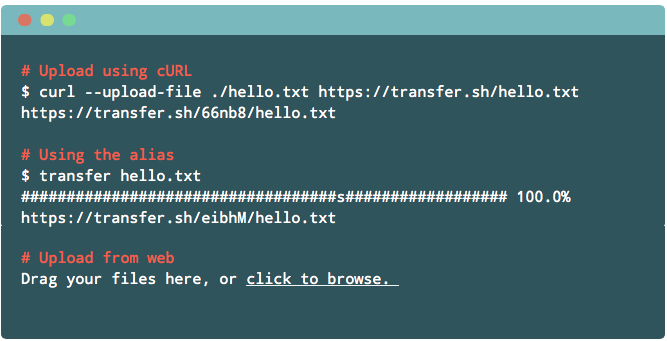 It enables us to easily and quickly share files from the command-line. With transfer.sh, we can upload up to 10GB. And the files are stored for 14 days by default. All we need is a simple and famous tool, called curl. No more ssh key. No more blind wait for the doggy internet. Firstly, don’t upload any very sensitive files. Limit download count. Like snapchat, we only allow one time sharing. I’m happy to get involved in this feature. See my discussion with Remco Verhoef in twitter. 1.4 How fast the download/upload speeds are? From my experience, it’s fast enough. Frankly speaking, I don’t worry about the speed. It’s issued by a command line. So machines can easily take over. For example, the intelligent retries, split big files into pieces, then upload in a parallel way. No human intervene is required in the whole process! After that, we get a http download link for the recipients. This works perfectly in an asynchronous way. 1.5 Vendor Lock-In, Or Service Is Closed? transfer.sh is an open source project in Github. We can even have a docker image to host the service in our server! Everything is under control now. Right?